If you have ever stepped out into the snow on your front doorstep you know how annoying it can be to step through the snow to your vehicle. Snow and ice can make a deep impact on your home’s temperature as well as making life in general a lot colder. Let’s talk about how you can keep your home and feet warm with an aluminum awning. Snow can cause damage to the outside of your home. It can cause water damage, frozen pipes, and can ruin your floors if tracked into your home. Ice can cause damage as well from breaking down your gutters to causing accidents. But when it comes to protecting your home, you can trust aluminum awnings. Unlike fabric awnings, aluminum awnings are sturdy and durable when protecting your home. They will not rip or tear under the weight of snow and ice and will help to protect your porch and doorway from moisture. Aluminum awnings will not only keep the ice and snow off of your doorstep, but it will also help to keep the sun and rain away. Rain can sneak into your home’s exterior and cause water damage and even mold. The sun’s ultraviolet (UV) rays can cause fading of your home’s exterior, furniture, patio furniture, and flooring. But when your home is shielded from these elements, you will be able to save money and time fixing the damages. Many people think of awnings as either fabric or ugly metal awnings that seem to be standard on old, dated home. But today’s aluminum awnings come in 16 different colors to make your awning customized. There are many different ways for you to protect your home from the elements, but there is only one permanent solution. 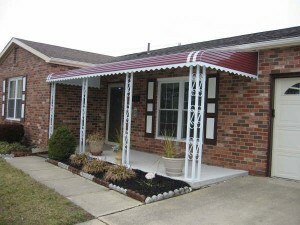 Aluminum awnings will help to protect your home with a classic and sophisticated style. Don’t let snow and ice ruin your holiday season! Avoid unannounced snow storms this season with an aluminum awning. For more information about aluminum awning or to have one installed at your home, call Carroll Awning today!